Reading about Hornton stone, the stone used at Broughton. It is from Hornton village about 6 miles away just up by Edgehill and the Warwickshire border. Here is a ‘richly satisfying hue’ in the mirrored picture above. I took it on a simple little camera one evening in February last year from the park. and just for comparison, a couple of showing how dramatically the stone changes – first on a grey autumn day, and then on a bright mid-summer’s day. 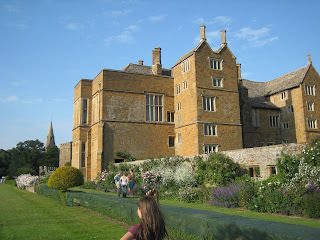 This entry was posted on Wednesday, January 21st, 2009 at 7:23 pm and is filed under Broughton Castle.